Sambal Goreng is a protein rich spicy coconut vegetable dish which is commonly available in Malay Nasi Padang Stall. This is one of Javanese Malay’s favourite dish. Another version of Sambal Goreng – Sambal Goreng Pengantin. Fry the tempeh and tofu separately until golden brown (Do not overcooked). Drain and set aside. 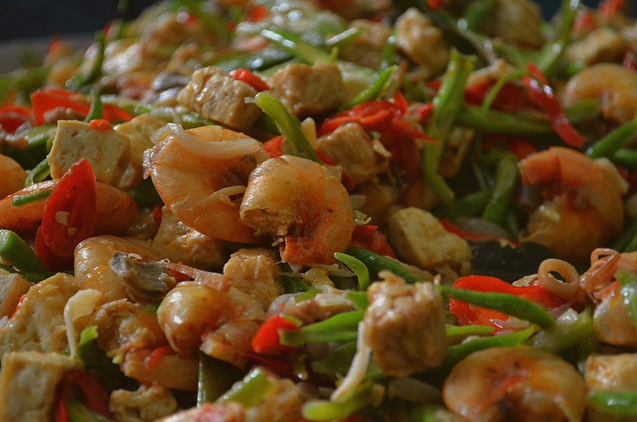 Stir fry the long beans, chicken gizzard and prawns for about 2-3 minutes then set aside. Blend all the rempah ingredients in blender to a smooth paste. Heat a little oil in pan and fry this paste until fragrant and untill oil separates. Add in the sliced chilli, ginger, lemongrass and shallots. Stir and add in the roasted belacan, tamarind juice and coconut milk. Add salt and sugar to taste. Reduce heat and simmer until the sauce thickens (there should not be too much gravy) slightly then add all the other remaining ingredients that were set aside. Serve with rice, serunding and rendang pandang.